The machines are filled with new pins, a set has been settled at the lanes end and you view an attractive bowling alley. It is a good feeling to see 10 clean white pins at the end of each lane. Players enjoy playing on a lane which is optically attractive and not just good to play. 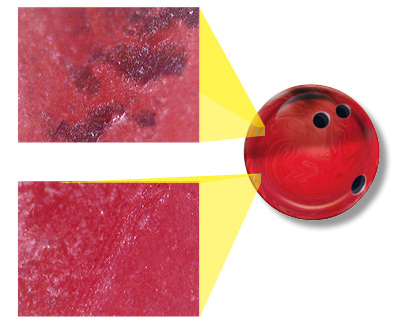 To permanently maintain this positive optical impression, a regulary cleaning of the pins is inevitable. But how can this be achieved fast and economically? A manual cleaning opf each individual pin is definitely not the ideal solution. The better alternative is a fast, efficient and economical cleaning of your pins in our Cleanstation system. 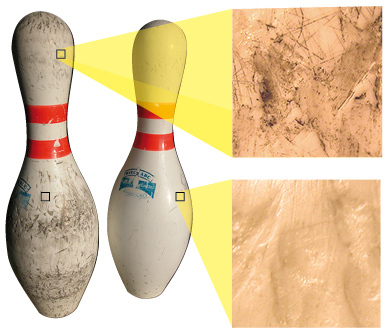 After extensive tests regarding the best correlation between frequency, amplitude, cleaning liquid and temperature we can offer systems helping you to keep your bowling objects in a perfect condition. 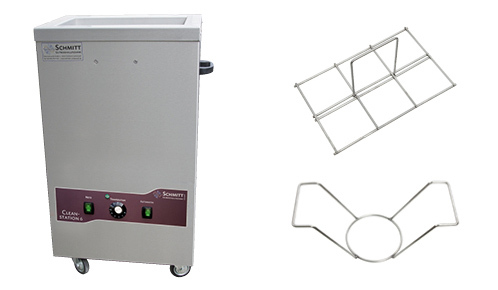 Schmitt offers two systems for cleaning Bowling pins, balls and machine parts – designed to clean 6 or 12 pins (or one ball) simultaneously, which are held in place by corresponding holding grid. The Ultrasound cleaning in a one-minute Interval with a turbulent flow function cleans even persistent durt particles (oil, grease, dirt etcetera). The cleaning takes just approximately 10 to 15 minutes. The partly micro-fine greases, residues and dust dirt even settles in the smallest capillary grooves and cannot be removed efficiently using standard cleaning tools like brushes or sponges. The Ultrasound Cleaning system loosens even the finest dirt particles from the pin within a few minutes – preserving the material. As 6 or 12 pins can be cleaned simultaneously you can easily calculate the time needed to clean you whole pin inventory. Our Cleanstation Ultrasound system is designed to clean up to 6 pins simultaneously. The downholding of the pins during the cleaning is carried out by a solid plastic block. The temperature is adjustable. The cleaning time takes approx. 10 to 15 minutes. After cleaning, the pins are dried using a rough textured cloth and shortly dipped into an optional sealing bath to apply a shiny surface, which also results in an optimum machine slipping behaviour and protection.